Delivers One of China’s Major Smart City Projects Using Standards-Based RF Mesh and IPv6 Technology in Guangzhou to Help Reduce Energy Consumption. Today, Guangdong Rongwen Energy Technology Group (Rongwen) and Silver Spring Networks, Inc. announced their selection to connect smart LED street lights in Guangzhou, China. Through its go-to-market partnership with Rongwen, one of the largest smart LED street light providers and operators in China, Silver Spring is planning to network more than 30,000 LED street lights in Guangzhou. According to Rongwen, its efficient and patented LED street lights and outdoor lighting controls, combined with Silver Spring’s StreetLight.Vision (SLV) Central Management System (CMS), will increase the city’s energy savings by more than 70%. The project is China’s first smart city project using Silver Spring’s secure, reliable, IPv6 platform and Wi-SUN® standards-based mesh technology, built on the IEEE 802.15.4g specification. Guangzhou, which is China’s third largest economic hub and a major foreign trade port, has committed to reducing its carbon emissions up to 45% by the end of the decade. “Guangzhou is an example of a major hub deploying an IoT network to drive sustainability, create resource efficiency and build a more livable city, which in turn draws in new investments. 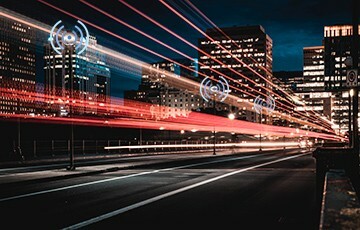 We are thrilled to connect smart city devices in our first project in China, as Rongwen deploys our standards-based platform to connect street lights and establish a foundation for additional smart city services for the Guangzhou Development Zone,” said Jeff Ross, VP of Channels, Silver Spring Networks. To further accelerate the delivery of Silver Spring’s IPv6 platform and solution to the growing smart city industry, today Rongwen and Silver Spring also announced the availability of the Rongwen D-ONE Wireless Outdoor Lighting Controller. The D-ONE integrates Silver Spring’s network interface cards (NICs) into Rongwen’s outdoor lighting controller to help monitor and control the brightness of the lights based on pedestrian and vehicular traffic, time of day and weather. The D-ONE utilizes a standardized 7-Pin NEMA Socket and collects a variety of energy usage information including voltage, current, lamp burning hours, and temperature. The D-ONE also integrates with SLV for seamless configuration, monitoring and real-time control.